Made for 52 Christmas Card Throwdown Color Challenge #40-18.This month's color challenge is to use silver in creating your Christmas card - which I did in three different ways; silver ink for giving depth the the snow on the tree, silver matting, and silver rhinestones to highlight the snow in the air and on the tree. The main panel is Stampin' Up! (SU) Smoky Slate cardstock cut to 3-3/8"x 5". I stamped the tree trunk from the SU "Sheltering Tree" stamp set using Memento Tuxedo Black ink. I used my MISTI to stamp the tree three times to ensure dark coverage. The snow on the tree was created as a two-step process. First I stamped the "leaves" using Encore! Ultimate Metallic Silver ink, then inked up the same stamp again with Creative Beginnings "Just for Embossing" white pigment ink and stamped again, but slightly offset from the silver image. This gave more of a 3D effect to the tree, which I really liked! 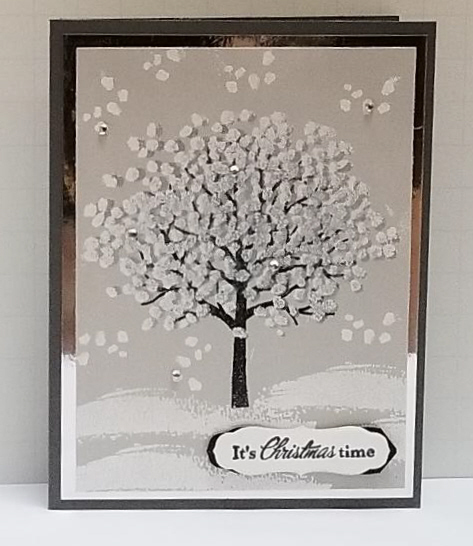 Since this white ink is pretty transparent unless you emboss it, I sprinkled Artfully Scribed Detail White embossing powder over the tree and heat set. 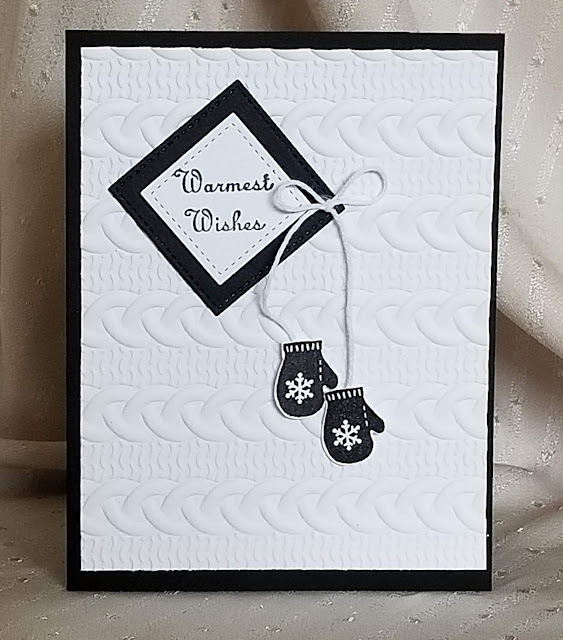 I used a matching snowflake cluster stamp and used the white pigment ink and embossing powder to create drifting snow in the sky. These too were heat set. The snow banks below the tree are from the abstract stamp in the same "Sheltering Tree" set, which i once again inked with the white pigment ink and dusted with white embossing powder before heat setting. Just a few silver rhinestones were attached to the tree and some of the falling snowflakes to give added depth and sparkle to the scene. The sentiment is from Momenta's Christmas stamp/die combo pack. I stamped it on a piece of white scrap cardstock, then die cut it with the matching label die. 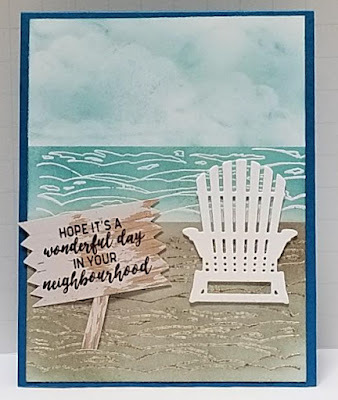 To create a more interesting shape, I also die cut the same label from a scrap of black cardstock, then cut it in half and attached to the back of the white label using Tombow glue. This combined sentiment element was attached to the main panel using adhesive foam strips. Finally, the shiny silver matting (4"x5.25") was glued to the SU Basic Gray card base, then the main panel was glued atop the matting. I think the card looks really elegant! 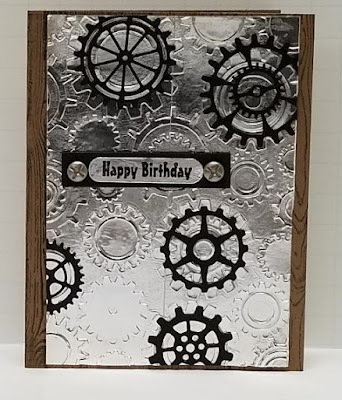 I certainly included silver on this card, which I am entering as a Design Team candidate with 52CCT. I am rating its difficulty level at "3" out of a possible "5" because of the need to do so much heat embossing. 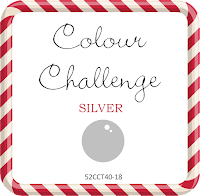 Gorgeus festive card you made :-)) I like how you use the silver colour.